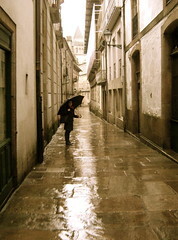 Lojo and I took a trip to Santiago de Compostela yesterday. It’s in northern Spain with a population of 100,000. 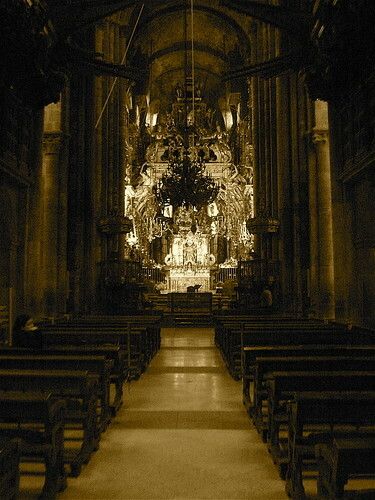 It is well known as the culmination of pilgrimage commencing from various points. Seeing pilgrims in the Catherdral, some having walked for weeks, and thus hobbling down the stairs, I realised the truth in the expression, ‘its about the journey, not the destination’. Lojo, having returned not so long ago from a similar travail, concurred, as we enjoyed the silence inside the cathedral.The tough, sleepless nights, 8 hours of climbing uneven stairs and so on challenges you mentally, physically and, like most of the travel we know, allows you to revisit your assumptions and priorities. You learn how little you can live without and become lighter in almost every sense. This evening I had the best palak paneer ever (= puree spinach with bits of amazing cheese). It was at ‘Punjabi Food‘. The youngish proprietors (maybe 30 years or younger) couple had been living in Spain for 8 years – first in Barcelona and now in SDC. They said they liked SDC better and gave a throwing head back, ha ha style laugh when I chimed in, ‘why, because no competition? ;-)’ But its true – they are the only place serving this kind of food. The veggies were mostly from frozen stock – well what can you do, its not like there is a spice vendor or Punjab ingredient distribution center around the corner. Slight aside – thats a small detail I’ve realize I suddenly missed about Turkey. The little stores selling all kinds of dried fruits and any spice you could imagine. It took us a trip to 3 different supermarkets over 2 days to find Zante raisins (mini-raisins), which we finally found along with cake baking supplies. Even though I’m no fan of packaged, processed, preserved food, I found myself slightly craving the canned dolma (stuff vine/cabbage leaves) also available at every supermarket and grocery store in Turkey. So back to Sajid and his (we assume) wife. Sajid maintained the front and the bar, his wife cooked away. Assuming something of their backgrounds, I asked if they or any other immigrant groups had ever faced any problems in the city. There were other Palestinians, Moroccans, Algerians and he said that everyone got along nicely, amongst themselves and with the Galician’s. They weren’t thinking of returning to Pakistan any time soon, “too complicated, difficult life.” We digressed into 5 minutes of Pakistani politics, as my mind went on search mode for whatever was stored in my ‘Pakistan news and current events’ brain file. I was also slightly disappointed with myself for only managing to come up with ‘shukria (thankyou)’ in Urdu, before French, English, Russian and Spanish started flying around. was also extremely appreciative that they had decided to move to this small location to be able to share their food, their culture and glimpses into the world which are too often prejudiced by negative traits. If your path should ever fall upon the pilgrims path in SDC, please do take a detour and visit this little spot. We were warmed and happy before having to step up in the drenching, 7 day non-stop with a week more worth of rain.